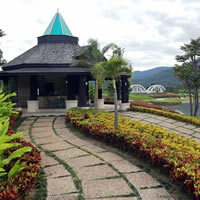 Gassan Marina Golf Club and Resort was built in 2006 and surrounds Chiang Mai’s largest lake. This is the third course to come from the Gassan Group and be built in Chiang Mai. Gassan Marina Golf Club is the longest Golf Course in Thailand. Another Chiang Mai beauty it features stunning views of the surrounding country side. The course features a plethora of bunkers and water hazards as well as long fairways and believe or not no par 5’s. All 18 holes of this course were designed around the large lake so bring some extra balls and don’t lose your cool. The clubhouse is huge (10,000sm) and features pro-shop, Thai and international restaurants, locker rooms, seminar room and large banquet hall. Designed with Dubai Arabian style in mind it’s a rather unexpected site in the Thailand countryside.